Year of the Horse Giveaway! Tomorrow marks the beginning of the Lunar New Year, the Year of the Horse, and we’re celebrating with another giveaway! When it comes to stir-frying the ingredient prep is just as important as there actual cooking, and one of the most important tools in food prep is a good cutting board. The folks at Bambu have kindly donated a 15 x 11 bamboo cutting board for our Year of the Horse Giveaway! They’re boards are handcrafted and sustainably harvested, and will last for years. 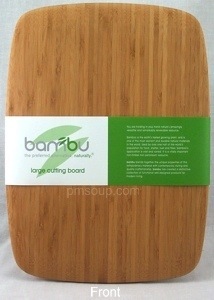 I have two Bambu cutting boards and believe me when I say that they hold up against a lot of abuse! 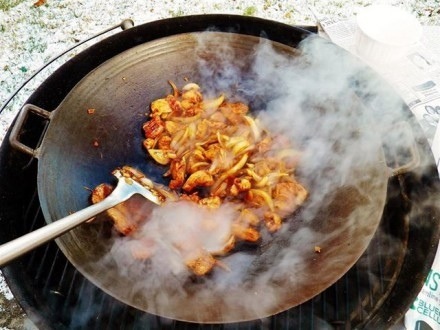 What has been your favorite dish you’ve made from “Stir-Frying to the Sky’s Edge”? OR, if you’ve just joined, what dish are you most looking forward to making? We’ll accept entries throughout the whole 15 day celebration of the Year of the Horse, so you have until 11:59pm EST on February 14th to enter! A winner will be chosen at random from the responses, one response per person please. Good luck, and happy Year of the Horse! Posted in Giveaways and tagged bamboo, bambu, chinese new year, cutting board, giveaway, lunar new year, year of the horse. Bookmark the permalink. This week’s recipe was a special one – scallops, the velveting technique, and good fortunes for the Year of the Horse. What did you think? Leave your thoughts below along with a link to your blog post! Happy New Year! New year, new stir-fry! Since the majority of the United States in currently in deep-freeze mode, it’s only proper that we kick off a chilly 2014 with a visit to the tropics by way of our woks. This stir-fry is a Wok Wednesdays favorite, with many of our members already counting it among their top dishes. What did you think? 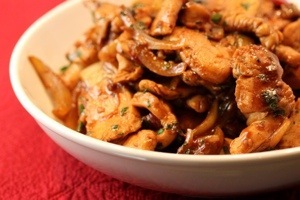 Leave your thoughts below and/or a link to your blog post about this week’s recipe.